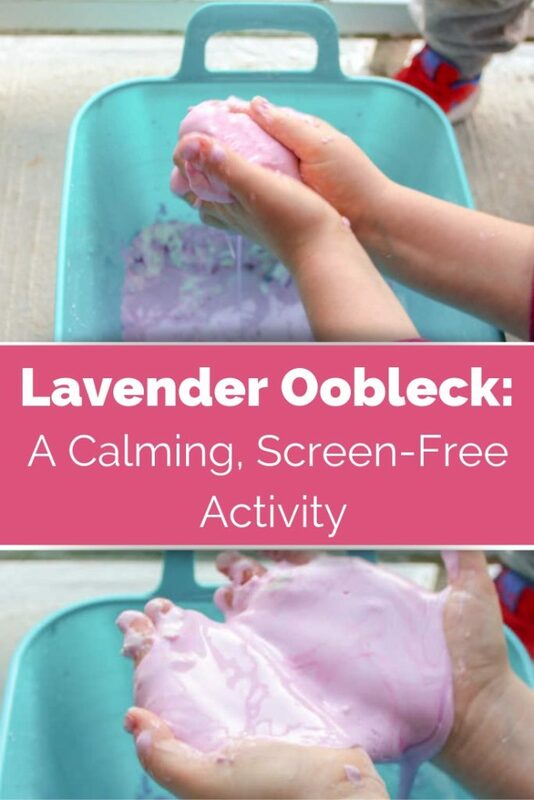 This lavender oobleck recipe is the perfect way to teach kids about science, promote the benefits of sensory play and help kids calm down. This screen-free kids activity is perfect for one-year-olds, preschoolers, and grade school kids alike. After school can be very touch-and-go in our household. Either my kindergartener bursts out of the school doors and jumps into my arms happy. Or, he is so bone tired he acts as though carrying his backpack is too much to do. We head to a park with lots of snacks and blow off steam there. I set up a sensory play activity to promote calmness. This week, I decided to whip up one of my kids’ favourite sensory play activities – oobleck. 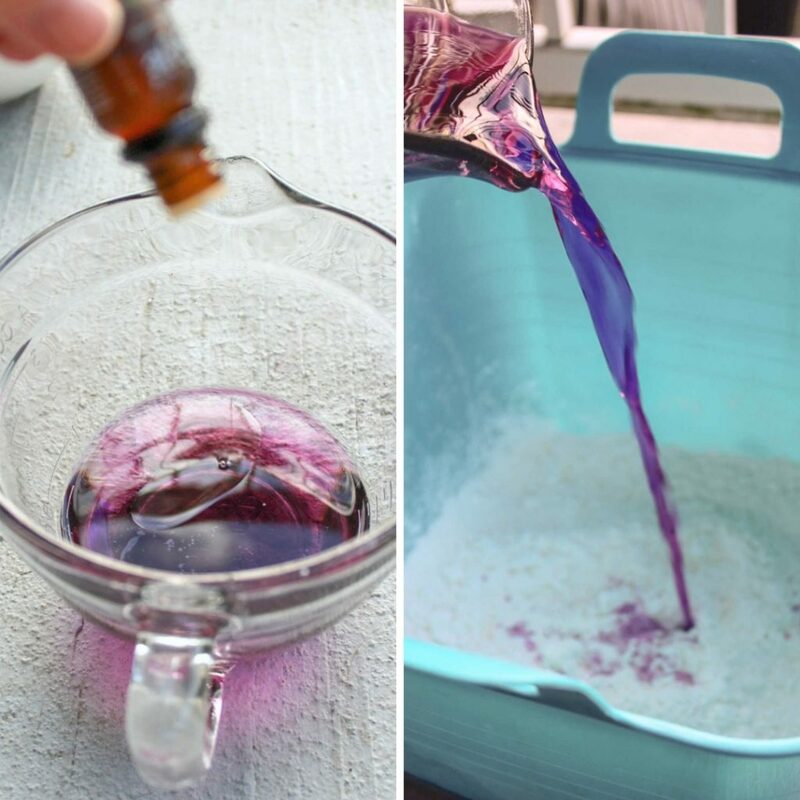 Make your lavender oobleck recipe outside, on top of a disposable table cloth or old sheet. Have a bowl of warm water beside your set up to easily wash hands. 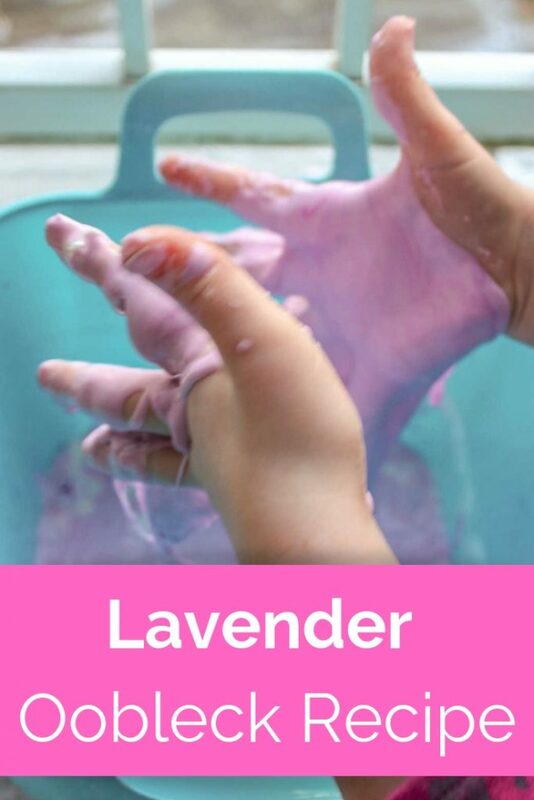 Only use toys and utensils inside the lavender oobleck that are easy to wash and don’t have small crevices. 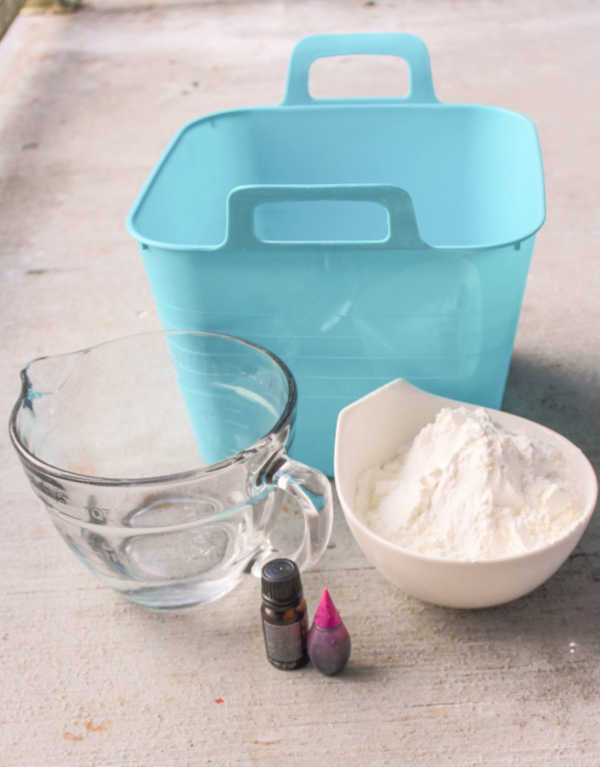 Store lavender oobleck in an airtight container and refrigerate. Use soapy water to clean up any remaining oobleck. Dried oobleck scrapes off easily. Use a butter knife to remove any excess, then wash with soapy water. In a separate container combine approximately three drops of lavender essential oil, water and food colouring. You can add each ingredient into the oobleck recipe separately. However, we have found it is easier to disperse the oil when it’s already in the water. Mix with a wooden spoon, kitchen utensil of your choice or your hands. 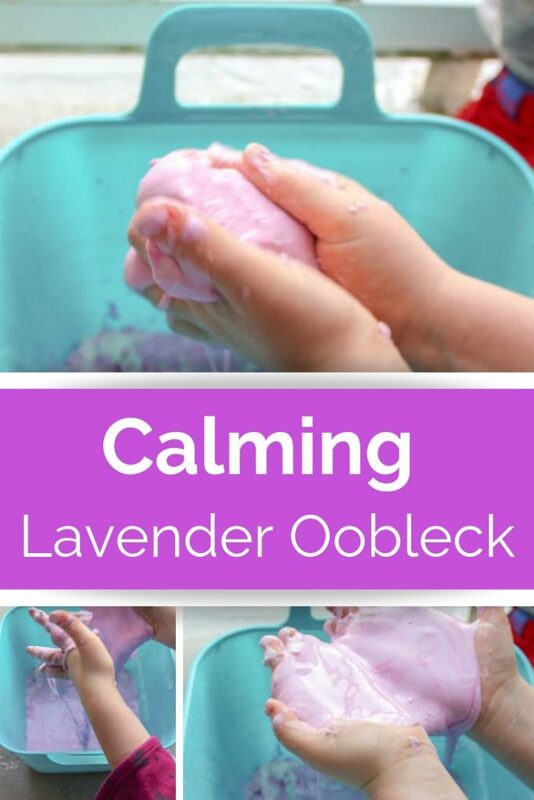 To enjoy this lavender oobleck again, store in an airtight container in the fridge. You may want to add a little more water to get desired consistency. The mixture should last in the fridge for a couple of weeks. My kids came home from school and my almost two-year-old joined in. They played outside on our deck for almost an hour. As the sun went down, I was pleased. Not only had they enjoyed screen-free time, but they were also quiet, played calmly, and there were no after-school meltdowns.